Dr Sarah Weston is a rich girl rebelling against her heritage. An archaeologist, she is a constant disappointment to her father who wants his daughter to be more obedient and take up a position slightly more fitting to her lineage and gender. Rachel is happiest in the field and her partnership with Dr Daniel Madigan is one full of excitement, pent up passion and together they make one hell of a dig team. A chance discovery of an ancient scroll, buried for centuries in the middle of a desert in Saudi Arabia give Sarah and Daniel cause to believe the lost treasure of Solomon is not a biblical myth, but a reality and they begin to ask questions that result ina deadly attack on their camp. A British millionaire, Trent Sacks, has spent his life trying to uncover the secret location of Solomon's treasure. He is the last living descendant of the Davidian line and as soon as he discovers the scroll exists, he sends his own agents to secure it. Is Solomon's myth real? Is there a treasure to be found and will Sarah and Daniel live long enough to discover it before Trent Sacks who wants to use it to announce himself as The Messiah, in accordance with Scripture? One of the good things about running your own blog, is that you can break your own rules every know and then. 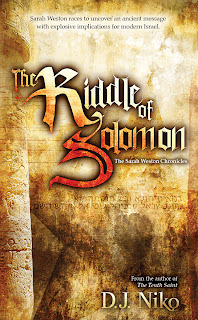 My wonderful followers know I concentrate on historical fiction, but I do read other genres and I was very surprised to find how much I enjoyed "The Riddle of Solomon", a modern day novel with a heavy emphasis on the Biblical past. Biblical conspiracy novels are ten a penny and most travel the same well-worn path, rehashing the same plotlines and not breaking any new ground. However, D.J Niko has written a novel steeped in rich detail and written with care and passion. I am not an expert in archaeology, or the Bible for that matter, but it is a refreshing change to read a novel where the author has done extensive research and has obvious knowledge of the subject in hand, rather than make things up for the sake of it and hope no one thinks too much about the historical element of the story. With summer coming, I am putting a list of reads together for my audience and I am happy to suggest "The Riddle of Solomon" for anyone taking their Kindle or a paperback to the beach. It is rich in detail, has a fast-paced plot and I give it 4 CROSSES !! 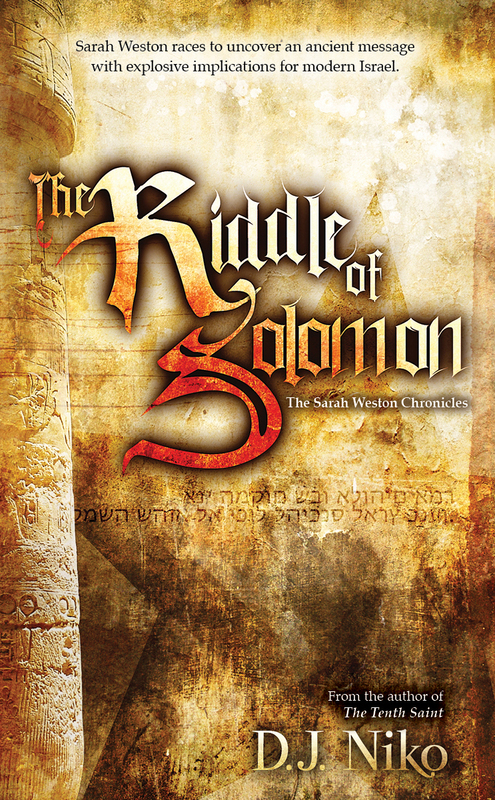 BUY "THE RIDDLE OF SOLOMON" FROM MY AMAZON STORE! I am a newcomer to your blog and right away you review a novel featuring one of my true loves, archaeology. I am endlessly fascinated with the idea of uncovering our past (and, write about it in my own work) so thanks for bringing this book to my attention.